Translational research was always one of Charité’s major priorities. 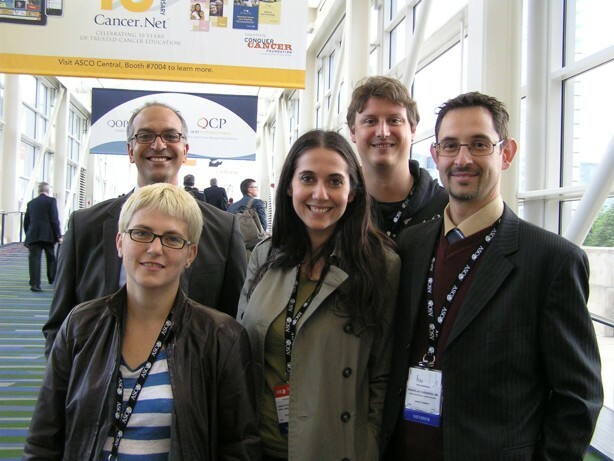 The Tumour Bank - Ovarian Cancer Network (TOC, www.toc-network.de) was initiated by the ovarian cancer group in the department and is an international network for bio-sampling of ascites, serum, blood cells, fresh frozen tissue and paraffin embedded tumour tissues from patients with ovarian cancer. TOC has established a standardized documentation of clinical data and systematic surgical procedures through its persistent efforts. The databank can be accessed online by all participating members. So far, TOC has collected biological materials from about 1800 ovarian cancer patients, thus presenting the biggest European tumour bank for ovarian cancer. P2 is leader of the bio-banking work package, having as main tasks the establishment of standard protocols for the collection, processing, deposition and delivery of the clinical materials. P2 is also responsible of the establishment of the online documentation system within OCTIPS consortium. It will monitor the collection, perform the quality control of bio-sampling and clinical data. Jalid Sehouli, M.D., has striking clinical experience in gynaecological oncology. He is active in scientific research and is the initiator and leader of the TOC-Network. He has extensive experience in clinical management of ovarian cancer and in designing and conducting clinical trials. He led the WP for bio-banking within the OVCAD project. Elena Ioana Braicu, M.D., is a physician working in the field of ovarian cancer. She is responsible for the management of the TOC and translational research in our group. Radoslav Chekerov, MD is a physician having a high expertise in the medical treatment of ovarian cancer. Dr. Chekerov is coordinating the clinical trials within our department. Christina Fotopoulou, M.D., PhD is a physician and has striking experience in the surgical treatment of ovarian cancer. Carsten Denkert, M.D., is senior pathologist and head of the Translational Cancer Research Group at the Institute of Pathology with a focus on the development of new predictive and prognostic markers in malignant tumors. He is the coordinator of the European FP7 project METAcancer (www.metacancer-fp7.eu). Silvia Darb-Esfahani, M.D., is senior pathologist with a focus on biomarkers in ovarian and breast cancer. Wolfgang Schmitt, M.D., is a pathologist with a focus on biomarkers in ovarian and breast cancer. 1. Sehouli J, Papanikolaou G, Braicu EI, Pietzner K, Neuhaus P, Fotopoulou C. Feasibility of surgery after systemic treatment with the humanized recombinant antibody bevacizumab in heavily pretreated patients with advanced epithelial ovarian cancer. Ann Surg Oncol. 2012 Apr;19(4):1326-33. 2. Braicu EI, Sehouli J, Richter R, Pietzner K, Denkert C, Fotopoulou C. Role of histological type on surgical outcome and survival following radical primary tumour debulking of epithelial ovarian, fallopian tube and peritoneal cancers. Br J Cancer. 2011 Dec 6;105(12):1818-24. 3. Braicu EI, Sehouli J, Richter R, Pietzner K, Lichtenegger W, Fotopoulou C. Primary versus secondary cytoreduction for epithelial ovarian cancer: a paired analysis of tumour pattern and surgical outcome. Eur J Cancer. 2012 Mar;48(5):687-94. 4. Coumbos A, Sehouli J, Chekerov R, Schaedel D, Oskay-Oezcelik G, Lichtenegger W, Kuehn W; North-Eastern German Society of Gynecological Oncology (NOGGO). Clinical management of borderline tumours of the ovary: results of a multicentre survey of 323 clinics in Germany. Br J Cancer. 100:1731-8, 2009. 5. Sehouli J, Loddenkemper C, Cornu T, Schwachula T, Hoffmüller U, Grützkau A, Lohneis P, Dickhaus T, Gröne J, Kruschewski M, Mustea A, Turbachova I, Baron U, Olek S. Epigenetic quantification of tumor-infiltrating T-lymphocytes. Epigenetics. 2011 Feb;6(2):236-46. 6. Denkert C, Bucher E, Hilvo M, Salek R, Orešič M, Griffin J, Brockmöller S, Klauschen F, Loibl S, Barupal DK, Budczies J, Iljin K, Nekljudova V, Fiehn O. Metabolomics of human breast cancer: new approaches for tumor typing and biomarker discovery. Genome Med. 2012;30;4(4):37. 7. Denkert C, Loibl S, Noske A, Roller M, Müller BM, Komor M, Budczies J, Darb-Esfahani S, Kronenwett R, Hanusch C, von Törne C, Weichert W, Engels K, Solbach C, Schrader I, Dietel M, von Minckwitz G. Tumor-associated lymphocytes as an independent predictor of response to neoadjuvant chemotherapy in breast cancer. J Clin Oncol. 2010 1;28(1):105-13. 8. Darb-Esfahani S, Wirtz RM, Sinn BV, Budczies J, Noske A, Weichert W, Faggad A, Scharff S, Sehouli J, Oskay-Ozcelik G, Zamagni C, De Iaco P, Martoni A, Dietel M, Denkert C. Estrogen receptor 1 mRNA is a prognostic factor in ovarian carcinoma: determination by kinetic PCR in formalin-fixed paraffin-embedded tissue. Endocr Relat Cancer. 2009;16(4):1229-39. 9. Schmitt WD, Siegert A, Lach SS, Fuhrmann S, Kondla A, Holm PS, Hauptmann S. Ribozyme to TGF-beta1 mRNA abrogates immunosuppressive effects of human colorectal adenocarcinoma HRT-18 cells in vitro and in vivo. Int J Oncol. 2009;35(4):901-8.